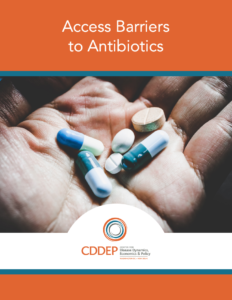 In a new report, CDDEP researchers identify key barriers that prevent access to antibiotics in LMICs and provides potential solutions to address them. In a new report, titled “Access Barriers to Antibiotics,” (available online here) researchers at the Center for Disease Dynamics, Economics & Policy (CDDEP) conducted stakeholder interviews in Uganda, India, and Germany, and literature reviews to identify key access barriers to antibiotics in low-, middle-, and high-income countries. The report makes several recommendations proposing action on antibiotic and diagnostics research and development, strengthening regulatory capacities, encouraging the development and diversification of quality local manufacturing, exploring innovative funding to reduce out-of-pockets payments, raising awareness, and improving clinical treatment guidelines. Health facilities in many low- and middle-income countries are substandard and lack staff who are properly trained in administering antibiotics. In Uganda, 10 to 54 percent of health staff posts are unfilled because of poor pay, high stress, lack of resources, and poor management. Staffing on wards is inadequate to administer medicines, patients miss antibiotic doses, and public nurses sometimes request compensation for administering medicines. In India, there is one government doctor for every 10,189 people (the World Health Organization [WHO] recommends a ratio of 1:1,000), or a deficit of 600,000 doctors, and the nurse:patient ratio is 1:483, implying a shortage of 2 million nurses. In low- and middle-income countries, weak drug supply chains fail to make antibiotics consistently available. In Uganda, researchers found that many products were stored and transported long distances without cold-chain temperature control, and only 47 percent of medicines on the WHO’s Essential Medicines List were procured through the centralized authority, resulting in chronic shortages. Moreover, public-private supply chain delivery systems were not leveraged to improve drug availability outside specific programs. Lack of oversight and regulation in the drug manufacturing and supply chain leads to poor drug quality and falsified medicines; 17 percent of the substandard or falsified medicines reported to the WHO are antibiotics, and each year, more than 169,000 childhood pneumonia deaths are caused by falsified antibiotics, researchers reported. Even when antibiotics are available, patients are often unable to afford them. High out-ofpocket medical costs to the patient are compounded by limited government spending for health services. In Uganda, where just 8.9 percent of the national budget goes to health services, 41 percent of health expenditure is out-of-pocket, and 23 percent of households spend more than 10 percent of their income on healthcare. Moreover, limited government spending results in drug shortages in public health facilities which forces patients to go to private pharmacies or drugstores to buy medicines that should be provided free. In India, 65 percent of health expenditure is out-of-pocket, versus 13 percent in Germany, and such expenditures push some 57 million people into poverty each year in India alone. Worldwide, the irrational use of antibiotics and poor antimicrobial stewardship lead to treatment failure and propagate the spread of drug resistance which, in turn, further narrows the available array of effective antibiotics. Finally, research and development for new antimicrobials, vaccines, and diagnostic tests has slowed since the 1960s as profitable investment in this area is limited by low sales volumes, short duration of treatment, competition with established products and less expensive generics, and the possibility that resistance will rapidly emerge. Encourage local manufacturing for cost-effective antibiotics. The Center for Disease Dynamics, Economics & Policy (CDDEP) produces independent, multidisciplinary research to advance the health and wellbeing of human populations around the world. CDDEP projects are global in scope, spanning Africa, Asia, and North America and include scientific studies and policy engagement. The CDDEP team is experienced in addressing country-specific and regional issues, as well as the local and global aspects of global challenges, such as antibiotic resistance and pandemic influenza. CDDEP research is notable for innovative approaches to design and analysis, which are shared widely through publications, presentations and web-based programs. CDDEP has offices in Washington, D.C. and New Delhi and relies on a distinguished team of scientists, public health experts and economists.